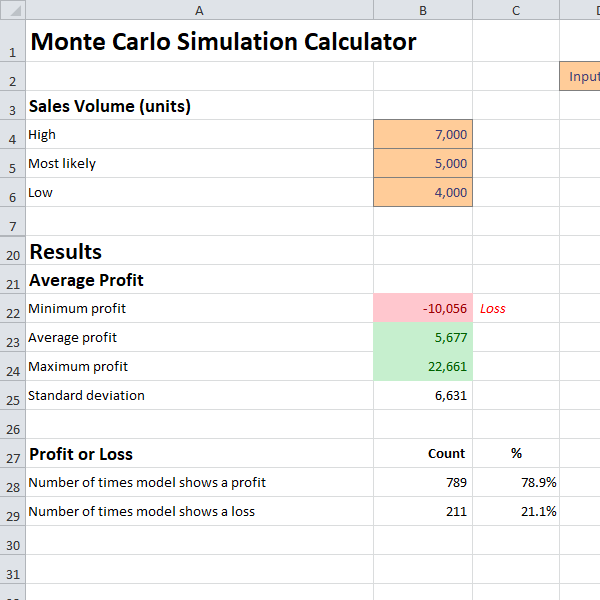 This Monte Carlo simulation calculator can be used to provide an estimate of the expected profit for a startup using a Monte Carlo simulation running one thousand iterations of a profit model for the business. The Monte Carlo analysis method is a statistical technique in which variables (in this case sales volume and unit cost) are changed at random and used to calculate the profit of the business. The technique simply selects random values for each of the variables based on a probability distribution and uses these to calculate the profit or loss. By repeating this process a large number of times (in this case 1,000) and calculating the profit or loss on each occasion an average expected value can be obtained. For further information see the Wikipedia Monte Carlo technique definition. Profit in the Monte Carlo simulation calculator is given by the following formula. The Monte Carlo simulation calculator allows a startup business to enter values for sales volume, selling price, unit cost, and operating expenses and then calculates the average profit of the business after running 1,000 simulations based on these input assumptions. As the Excel simulator uses randomly generated numbers the results will change each time the spreadsheet is updated or the F9 key to recalculate is pressed. This Monte Carlo simulation calculator assumes that the sales volume, which represents the number of units of product sold, can take any integer value between given high and low values with a most likely value sitting between these two extremes. To use the calculator enter the high, most likely, and low sales volume in units. It should be noted that the calculator will show an error message if the most likely value is not between the high and low values or if the high and low values are the same. The calculator provides random guesses at the sales volume based on a triangular distribution. The triangular distribution is a continuous probability distribution with a triangle shaped density function and is the simplest way to model this sort of three point probability defined by high, low, and most likely values. Enter the unit selling price of the product. Enter the unit cost of the product. Unit cost in this model includes all the costs normally included in cost of goods sold or for a service business cost of revenue. This Monte Carlo simulation calculator assumes that the unit cost can take any value between given high and low values with a most likely value sitting between these two extremes. To use the calculator enter values for the high, most likely, and low unit cost. Enter the fixed operating expenses. Operating expenses are all the support costs of a business which are not directly attributable to the goods or services that the business is producing. For the purposes of this Monte Carlo simulation calculator they are assumed to be fixed. Based on the inputs the Monte Carlo simulation calculator runs the profit model one thousand times using randomly generated numbers. The calculator outputs the following results. The Monte Carlo analysis provides a simulated average profit for the business based on random values. To repeat the simulation enter new values or press the F9 key to cause Excel to recalculate. The Monte Carlo simulation calculator is available for download in Excel format by following the link below. Users use this Monte Carlo simulation calculator at their own risk. We make no warranty or representation as to its accuracy and we are covered by the terms of our legal disclaimer, which you are deemed to have read. This is an example of a Monte Carlo simulation excel spreadsheet that you might use when preparing financial projections in Excel. It is purely illustrative of a Monte Carlo simulation finance calculator. This is not intended to reflect general standards or targets for any particular company or sector. If you do spot a mistake in the Monte Carlo simulation excel template , please let us know and we will try to fix it.